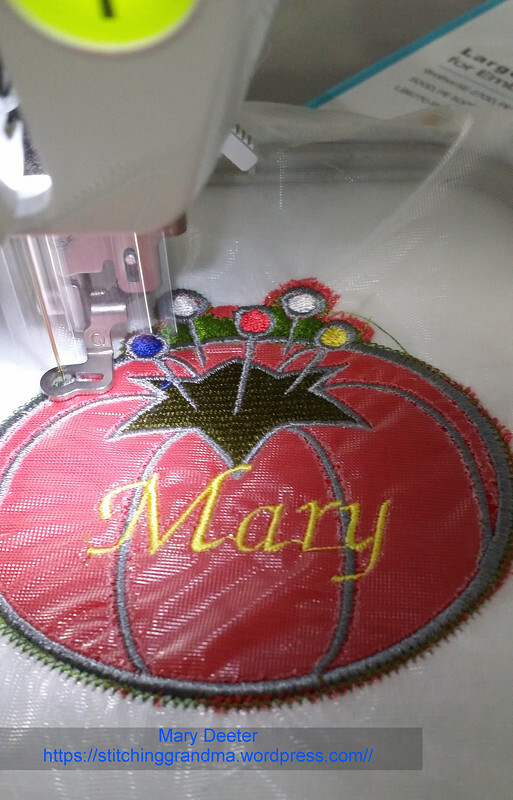 Did you read my last post Embroidery Machine Fun and other small projects and wonder what the “other small projects” were? I got distracted posting and had a deadline to leave, so I left you hanging ! Sorry about that! I had another (3rd one this week) bike ride to take! So, let me begin with that story! There were 30 or more riders, and we all had on bright neon yellow shirts – great SWAG from LIFECYCLE. 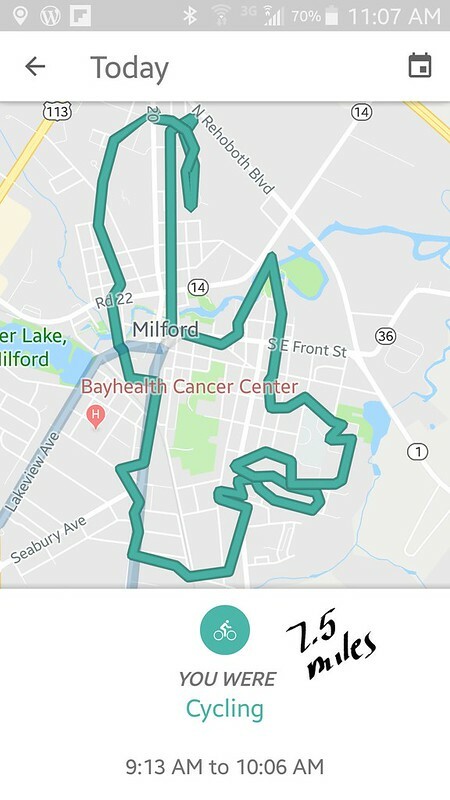 My third ride this week was on Thursday morning. I dashed out the door following my post, which is why I forgot to get to the small projects! I met up with a small group again for another ride around town. This one is led by my daughter and took us a little bit further, but similar amount of time. We had 4 riders, and one passenger, my 2 year old granddaughter. She rides along in her trailer, munching on her banana or strawberries, etc and enjoying the view. She loves seeing the trash trucks as we ride by! She cheers her mother and the rest of us on as pedal. 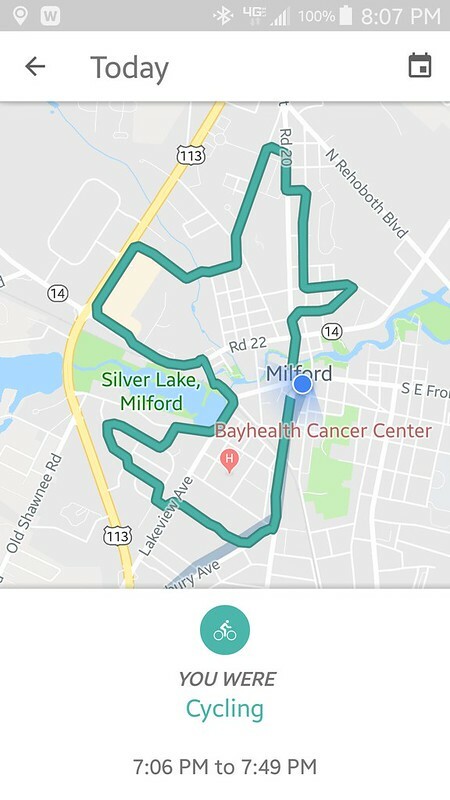 We covered about 7.5 miles on Thursday morning. I’ve told my friends I keep trying to encourage to join the ride, that since we are essentially going in a big circle, it is easy to “return to center” if you were not up for the mileage. 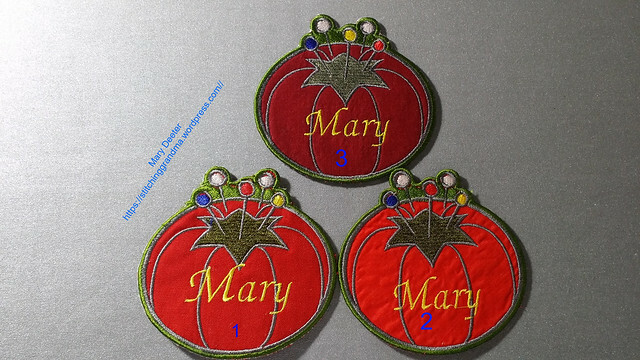 And now –Small projects – I made another project on my Embroidery machine this week. Actually, have done the same project twice THREE times. You will notice in 2 of the photographs that I numbered which run the project is from. The design is from Embroidery Library and is called a Pin Cushion Magnet. The idea is to hot glue a magnet on the back and use it on the fridge, but our Embroidery Club made them for name tags. I missed the meeting where they worked on theirs, and I decided to finally make my own. I had to “check in” with the leaders to see if I was correct in taking the right steps to stop the program and insert my name. This is my “first run”. I hooped vilene wash away stabilizer , floated a piece of tear away under the hoop and have no show fusible mesh on the back of my applique piece (the tomato), front and back. I always use a water soluble topper (WSS), which is the shiny stuff on top. I stopped the machine after thread change 9, exited the design, and used built-in fonts on my machine for my name. I played around a bit with the placement. Then I reloaded the design software, jumped ahead to thread change 10 and restarted the stitchout. 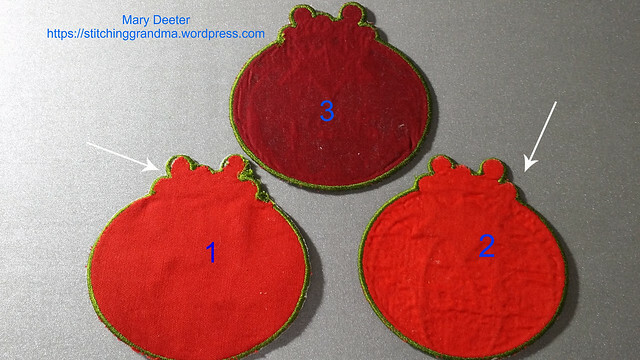 In the photo it is doing the “tack down” stitches to secure the back piece. The point of stopping the software is to get your name on the front stitched out before putting on the back piece. Since you have to remove your hoop and change your bobbin color to match the last 2 colors it seems like the perfect time. Now, why a first run…well…..2 reasons. Thread breaks at the very end, last 500 stitches or so, and ill fitting back. I cut out the applique using the dieline file I printed out, and it gapped in a couple of areas around the top. I felt like I cut on the lines, but that was “too close”. So, I made a 2nd run on Thursday. This time, I stitched out the die line files on tear away stabilizer and cut them out around the edges, leaving about 1/4″ all around on the stabilizer. AND..I think when I made the first one, I put the dieline pattern on the BACK of the fabric. (I’m not certain). So, once I had new dieline patterns, I made sure to cut on the FRONT of the fabric. (Right sides made a difference). For the 2nd run, I prepared the fabric again with no show fusible mesh on the back of the applique fabric, cut out the shapes, hooped 2 layers of Vilene wash away (running in opposite directions in case of stretch) and did not float a tear away underneath. The reason….I don’t want to see the little white bits of tear away poking out along the edges of the final stitches around the outside edges. Once I had stitched out completely, I removed the design from the hoop, cut away the vilene, and removed as much of the WSS as possible with tweezers. On the first project, I used a wet q-tip and dabbed at the remaining WSS and along the edges of the vilene. On the 2nd project, I got impatient, brought it in to the kitchen sink and turned on the hot water and soaked it completely. PROS / CONS — The double layer of Vilene was awesome. Gave good stability to the stitchout. Soaking it made everything get “wrinkled” and I am hoping a good press from the iron will improve the look. My third try, I used the dieline template to cut out my red fabric and I cut it 1/2″ larger all around than the dieline. I also put a piece of batting, cut just a bit smaller than the dieline for the front piece. I used the same stabilizers and laid the batting on under the front fabric, and got busy stitching. I went though the entire process, and after the tack down stitch for the back, I removed the hoop from the machine, and used my tiny scissors to trim away the excess fabric on the front and the back of the name tag. This make sure I got all the edges caught under the stitches. After it finished, I removed the stabilizer and “melted” the vilene with a cotton swap and water. All looked great…..until I hit it with the iron, which still had steam going….and the whole nametag started to curl up. The vilene was MELTING inside the project because of the steam. Evil thoughts went through my head, and then I decided I was going to be smarter than the name tag. Since it was already curling and looking melted, I got a piece of flannel out, and laid the tag on it. I sprayed the tag until it was soaking wet. Then I used the flannel as a “sandwich” and just kept ironing the tag until it laid flat. It took about 10 minutes of pressing, with a large piece of flannel that was soaking up the moisture, changing positions every minute or so, but FINALLY, I have a flat project that does not look like it shrunk! The front looks good but the back has some wrinkles. I can live with that! Time to get out the bar pins and get one hot glued on the back of the tag. I used 3 different fabrics, and they were all from the scrap bin. Fabric for run # 2 was really thin, which I assumed accounted for all the wrinkles. Fabric # 1 & 3 were of equal weight and quality. #1 & # 2 contained no batting. #1 was never completely wetted. You can see in the photo below of the backs of # 1 & 2 (near the arrows) where the fabric didn’t quite get caught under the edge stitching. I am now convinced it is worth cutting “bigger than the dieline” and using the sharp applique and pointy scissors to trim the oversized piece. # 3 has great edges. In hindsight, a piece of batting on the back would have been a good idea. In the photo’s # 3 is still a bit “wet” from all that spraying and ironing. 3 of my fellow embroidery friends were here on Friday, and wondered why I was still “trying”. I considered this little project a good learning experience! As one said, “third times the charm”, though I was doubting that for a few minutes this afternoon. I’ll never be a “pro” at this embroidery gig, but I learn with each project. 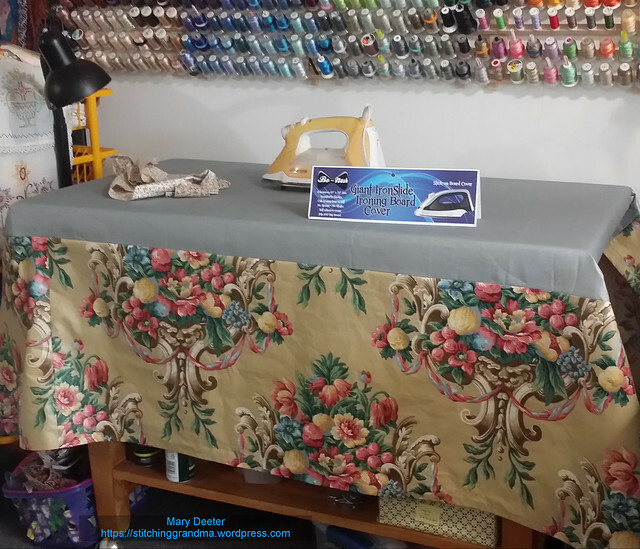 Other small projects – I recovered my ironing station this past week. My original board cover was four years old and just recently started to show terrible wear. I ordered another Bo-Nash cover for my big board several months ago. I had to add extra width to the cover so it would completely cover my station, which is an old butcher block kitchen island. The previous cover I had added about an 8 inch “skirt”. This time, I decided to go much longer, with the goal of hiding some of the clutter than lives under the ironing station. I have bolts of decorator fabric I was given years ago, and chose one that wasn’t totally hideous. I do like the extra length. Nobody needs to see my gallons of water, cans of spray starch etc. Plus, it might prevent me from arbitrarily tossing stuff on the shelf underneath. If I am going to put something there, it will be with definite purpose! I have 2 more placemats that are pin basted and ready to quilt, and since the feed dogs are down, I intend to work on them next. Once they are all quilted, I will trim them all to final size and set to making binding. I also have another binding project, but it is not for my own quilt. I brought home a quilt that Trish has been working on at the assisted living place where I volunteer. She did all the machine quilting, and I offered to trim it and bind it for her. She is anxious to gift it to a young mother who works at the facility whose baby had just been born this past week. 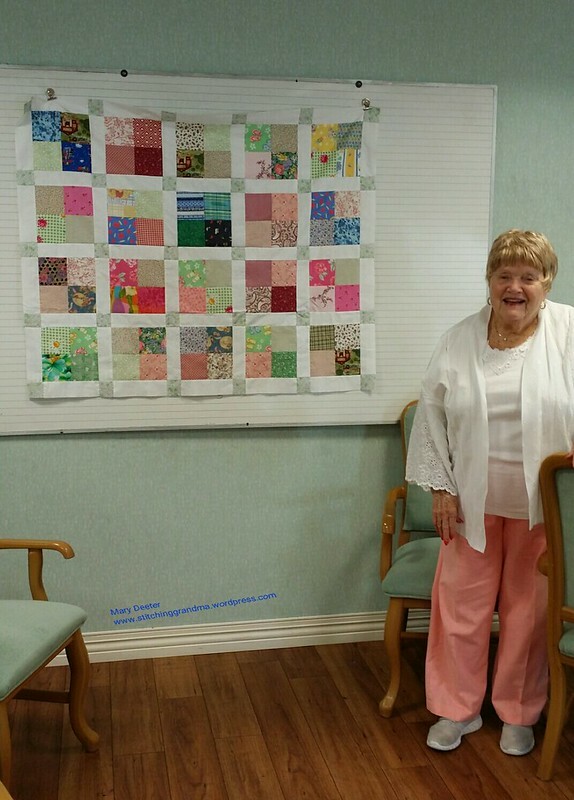 Trish is a resident who does a lot of sewing for other residents and staff members. She was tickled to learn how to make a quilt. I think she did a fine job. This past week when I went to volunteer, Trish was finishing her quilting, and there were 4 other ladies working on projects. Two new to the group are hand piecing 4 patches, and another was working on pinning a blouse for alteration. It is so fun to see my favorite resident, 101 year old Elsa come to sew. She had fabric cut to size to make sachet bags. She did all of her own pinning and machine sewing, and I employed my assistant (aka husband) to press for her. One of my hand pieces, Dotty is 99! I believe they were having fun, and am convinced that IS the secret to a long life! Any projects going on in your sewing room this weekend?? ?